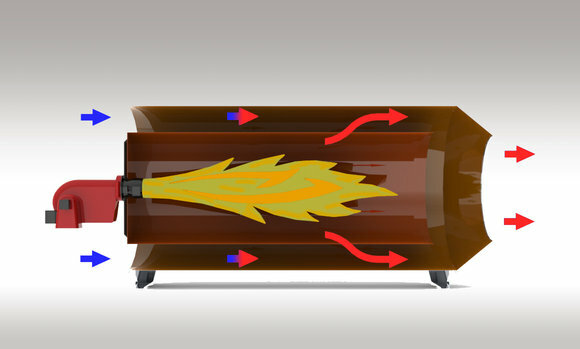 Direct air heaters are used for firing of oil or gas fuels. They heat up the drying air of STELA dryers and are also used for other industrial processes, e.g. in the brick making industry. The direct air heater consists of an outer casing, an intermediate casing against radiation losses and a perforated combustion chamber made of highly heat-resistant steel, which is arranged centrically in the casing. The hot combustion gases are mixed with the fresh air heated up at the wall of the combustion chamber and a hot air of homogeneous temperature is produced. The energy of combustion is thus fed directly into the dryer. The firing efficiency is 100 %.